"I'm in a crafty funk" she said ...How many of you have felt this way ?? I know that challenging myself to create and/or share something creative every day of 2014 has given me many an opportunity to get into a crafty "funk".. And also how to get out of them.. My fellow Design Team member Paula was in a crafty funk... So I offered to challenge her.... I would give her 3 themes to choose from.. She would pick one and create something..The themes I decided on were 1. Pink Snowflakes 2. Retro Christmas or 3. Text Background. It started out between just the 2 of us but then some fellow DT members became interested, so I posted it for all of us to participate in. There is no deadline but 2 of us have completed it already so I wanted to share it with you here. I also am sharing my card on Unity Stamp Company's Friends With Flair , which is a Friday post on their blog. My theme was Text Background.. I chose a new stamp "Tis the Season" by Unity Stamp Company . For my text background, I used American Crafts "Dear Lizzy" Christmas patterned paper. The borders were by Paper Bouquet and the twine is from Whisker Graphics .I also used a bit of Snowflake Kraft washi..
Paula actually finished her card just a few hours after I challenged her. 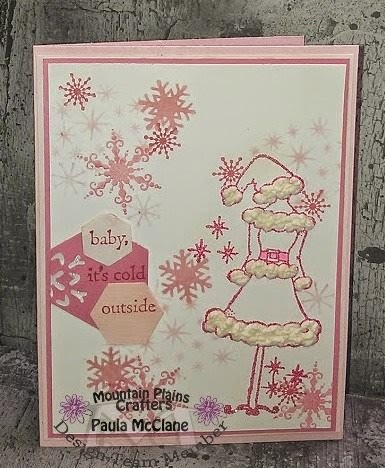 She used "Baby, It's Cold Outside" by Unity Stamp Company .. Her theme was Pink Snowflakes.I think she did a fantastic job of getting out of her crafty funk. And did you notice how similar our color schemes turned out to be ?? Hope you enjoyed our challenge results. When you get in a creative funk, choose a few themes or pick out a few supplies and work from there. It will help you start on a new project. It can be as simple as a color. Choose something out of your comfort zone. Ask a friend to join you. You will be creating something new in no time at all !! Comment and tell me what you do when you are in the midst of a crafty funk.. How do you get that creative spark back ?? I love Christmas cards in non-traditional colors, both are adorable. So do I, Shelly ... I like how our cards had similar colors .. Thanks for commenting !! Lisa, thank you very much !! Great cards! I especially love the pink snow and stick lady! Thank you so much !! I relayed your message to Paula, the stick lady's "mom"...She was thrilled !! Thank you for the needed inspiration - love these! Glad these inspired you .. Thank you for commenting !! Paula & I thank you !! Brilliant idea to challenge each other. I love all the choices and am such a fan of pink. Great projects to share sweetie. Wonderful cards and great idea of how to get out of a crafty funk! Great cards. Love them both. I'm the sad down in a funk friend you challenge out of the hole. Thanks for helping me outta that! I am always happy to get you out of a crafty funk and also to help contribute to your Craftoholism !!! You're the best, Paula !! This was loads of fun !! That first card...I love the deer. I am having to sit on my hands to keep from ordering. What did you think of their new stamp sets? Thank you ... I did have fun with those border strips !! And I agree, that deer is fabulous !! What fantastic cards Debra! Love the one with the deer especially! The challenge is an excellent idea! I really love the papers you used. Thanks, Mary Anne !! My enormous paper stash always does me proud !! Love all the pink in both cards! Paula & I thank you !!! We had fun with this challenge !! Darling! Love the story of the internal challenge you had to help someone out of their funk. Great card, love the challenge idea!